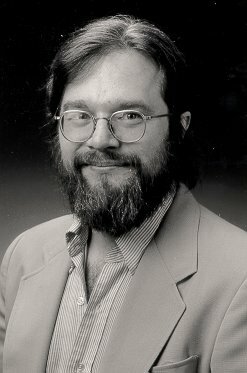 Born in 1954, Carl is currently  chair of the composition department and director of the computer music studio at the Hartt School of Music, University of Hartford. He is also a director of the Extension Works new music ensemble in Boston, and writes extensively on new music for Fanfare magazine. Several of Carl's works have been put on commercial recordings, including his complete piano music on Centaur Records, Time/Memory/Shadow for sextet on Neuma, Towards the Crest for solo bass clarinet on Koch International, A Wide Open Field for electronic cello and orchestra on VMM, Duke Meets Mort on Lotus Records and Magic Act for violin and marimba on The Aerial. In 1988 his Roundabout for contrabass and computer-generated tape was released on an Opus One LP celebrating the 50th anniversary of the American Composers' Alliance. This past November, Robert Carl visited Chicago once again, and stopped by my home to chat about all kinds of things. Knowing his way around the Windy City, he arrived looking quite casual and comfortable. We started out by speaking about appearance . . . . .
Bruce Duffie: You mentioned that you "look like a composer." Is there some regimen that all composers look a certain way and conform to this? 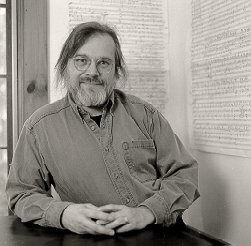 Robert Carl: (laughing) No, there isn't, but I do think that the beard, the wire-rim glasses, the pony tail and being all in black marks me as being a composer of a certain generation! BD: Are composers in their 40s and 50s of a certain mind-set that they all tend to look the same way? RC: I don't know about the look, but it's true that the generation I'm part of is one which came out of the 1960s. Most of us were in High School and in our formative years when the 60s happened, but I think that it definitely had an effect on us in terms of lifestyle and musical aesthetics. When I look at the composers who are peers of mine, we were of a generation where our teachers were very much of a kind of "heroic, modernist generation." I studied with Ralph Shapey here in Chicago, who is one of the three or four teachers I had who really taught me something, and that was the most concrete technique. BD: I assume he didn't teach you what to say, but how you could get it said. RC: Yes. Ralph taught me how to write a phrase and how to write counterpoint, which I am deeply grateful for. But students of my generation feel a reverence for the composers of his generation and their heroic attitude and high artistic ideal. We were coming of age at a time when the modernist shibboleths were falling, and there was a certain opening up to a variety of other types of music which were not quite in the standard western classical canon. The question was how do you reconcile a devotion to high artistic standards with a certain degree of openness to the world around you. BD: Have you reconciled this now, or are you still in the process? RC: I think it's a lifetime process, but I feel increasingly comfortable with it now. BD: Is this increasing comfort reflected in the sounds that you produce? RC: I think so. I'm finding is that it's much easier for me to create music that has genuinely beautiful harmonic content, but which doesn't necessarily conform to any exact prior model. One of the things that probably was lost during the middle of the 20th Century was a sense of harmonic beauty. BD: We're all coming back to it now, or are most coming back? RC: It's coming back in a much stronger way, but it depends on the composer, of course. Now and then, there's music which has pleasing harmonic surface to it but isn't terribly satisfying beyond a certain sugar-coating. Harmony is pleasurable to me not because it has consonance in it, though I've grown to love more consonance in my music and in others', but because it has meaning. It has some sort of direction. When you reach a certain point in a piece, something happens where you feel a sense of opening up or arrival. It's a landmark that is pregnant with meaning, and harmony is one of the things which best allows that to happen. One thing that I did have to do for myself was to really go back and study earlier music and learn what were the general ideals and principles of harmony from successful music of the past that I could adapt to my own needs and language. BD: Are you writing for a specific public or a general public or yourself...? RC: It's still, first and foremost, for myself. I definitely want it to be communicative. It comes out of expressive poetic imagery that appeals to me. It comes out of life experience. All of these things come together to motivate the music. I would like it to express something to people who hear it that will be meaningful to them, so, in that sense, I'm writing for a public, a listener. But they have a complete right to decide that whatever I want to express is of no interest to them. I can't really anticipate them. I've come to feel that you cannot predict audiences. They vary so much. It can depend on what you ate before you came to the concert to determine how you will react. Having said that, there is one dichotomy that I work with. If a piece of mine is going to be premiered or primarily played in Europe, I will tend to write in a little bit more overtly modernist manner than I would for a piece for the US. BD: Because they ‘get it'? RC: It's not even that they ‘get it.' People ‘get it' here, but people seem to be tired of it here, and in Europe, people are a little bit more afraid of something that might be seen as nostalgic or sentimental. I have a piece (which is on the Neuma CD) which is called Time/Memory/Shadow, and it ends with a little march, which I wrote when I was just starting out. It's very tonal and sounds a little bit like Elgar, and the whole piece, which is crazy and full of avant-guard things, works its way through up to the point where the march is revealed. It was done in Berlin about three years ago at a festival in Kreutzburg, and it was a fantastic performance. At the end there was this stunned silence and someone near me whispered a German phrase that I later found out meant, "Well, that had balls!" It was because it was so tonal, and it got a very strong response, but it was definitely riskier. It allows me certain impulses that I have that are more textural or chromatic or abstract which I feel I can indulge when writing for a European audience, which I'd think twice about with an American audience. BD: I assume you're being true to yourself no matter where it will be done. RC: The stylistic diversity between these two approaches is really very small. It might only be recognizable to me in terms of the way that I think about it. Also, I don't mind having a little bit of a challenge of constraint put on me by circumstance. I like to see how I can make something that feels satisfying to myself whether the constraint is instrumentation or subject matter requested or the audience or place. I like to interact with that. The piece that was done here in Chicago last night was premiered in Russia in 1997 at the St. Petersburg Musical Spring Festival. It has a certain sort of dark spaciousness about it, a starkness, and I felt it was sort of an homage to Shostakovich especially his chamber music and the late quartets. Even though the harmonic language and the gestures are not the same, there was a certain spirit of the place that I was writing for that I wanted to engage in and find my response to. BD: But it didn't start that way. It came to that in the music. RC: Exactly. It emerged over time and was a realization for myself as I was doing it. BD: Are there times when you find that the music shakes you by the throat and dictates where it will be taken? RC: Yes, definitely. Every piece develops its own momentum after awhile. I'm more than willing to follow it. When I write music, I tend to have a fairly firm sense of its global character before I start. That doesn't mean that the details are fixed in any way, but I feel as though I have some sort of literal image or even an architectural plan for the piece. Sometimes it's a feel for a type of process that might have an analogy in some sort of natural way. BD: So you're discovering it as you go along? RC: I think that I find whatever is the core idea or image of the piece. Then that defines it enough so I can do the exploration with a certain sense of freedom. Then the notes will flow pretty readily. The gestation time of the piece is finding that image, and then the actual writing happens pretty quickly. BD: Does the gestation change from piece to piece - sometimes long, sometimes quick? RC: Yes. It depends on the nature of the piece. Certain pieces have been gestating for ten years and I didn't know it! Then, two months before they start getting written, all of a sudden they're there. BD: Do you have more than one piece going at a time? RC: Yes, I do. I've been through a real swath of fairly large pieces over the last four years, most of them chamber works. BD: Of similar style, or not? RC: That's a very good question. More than previous pieces, over the last four to five years I've written a number of pieces that feel are parts of a set. The one from last night, which is for flute and piano trio, a string trio, a (second) violin sonata, and a (second) string quartet. There's also a piece which was premiered three nights ago in Boston for soprano, mezzo and harpsichord, and another piece for soprano with kind of crazy 21st century baroque chamber orchestra. With those done, I've now got three other pieces which are in varying stages of completion, and usually one piece will say it's got to get done and the others fall by the wayside until there's time for them. BD: Do you ever get overloaded and deadlines come thick and fast? RC: In recent years, no. About 1995-96, I came close to overextending myself, and I just got done by the skin of my teeth. I don't want to do that again. I'm happy with the works, but it was almost desperation composition. BD: One of my favorite questions, especially for someone who does a lot of teaching and a lot of composing - do you get enough time to compose? RC: I think I do. I teach at the Hartt School, which is part of the University of Hartford. It's a wonderful place with great colleagues and stimulating students. My teaching load tends to be individual lessons and one course over the whole range - from freshmen to doctoral students. I chair my department, but it's easy - relatively speaking. The administrative work is not overwhelming. There's as much stimulation given as there is time taken, so it's an even tradeoff. Hartt has been a very good laboratory for trying out pieces. I'm very grateful for that, but I just seem to find time. I compose a lot over the summer and go to artists' colonies a fair amount. There, I just go hog wild. It's almost a mania. Not 24 hours without sleep, but it's very intensive for me. BD: Would your music sound different significantly - or at all - if you didn't have to earn dollars? RC: Ten years ago, if I were given all the time in the world, I'm not sure I'd have known how to use it. Now I do feel that it would be entirely possible to write music all the time, and it would be a natural thing. That prospect is not on the horizon, and I don't mind because I get an enormous kick out of teaching. I really love doing it. The students are fresh, idealistic, and often have great ideas. Right now, I have a student writing a four-hand piano piece, but each player can only use their index fingers. It's very catchy and ingenious with a great theatrical sense. But all the students seem to have something unique and interesting relative to their development, so I would actually hate to give up the lesson format. If I had all the time to myself, I would want to carve out a day where I would be meeting with students. Certain composers, like John Corigliano and Harrison Birtwistle, have exactly that kind of situation with four or five of the top students at Juilliard or the Royal Academy of Music. That would be very nice, but it's not an expectation of mine. It is a way for a composer who is at the height of his or her career to share their knowledge and keep engaged. There is a grand tradition of mentorship and apprenticeship that goes throughout the western tradition. BD: Are you part of a general or specific lineage of composers? RC: Because of Ralph Shapey, I can trace a quasi-direct lineage back to Schumann. 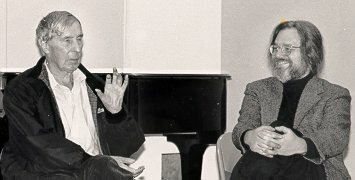 Ralph studied briefly with Wolpe, who studied with Webern, who studied with Schoenberg, who studied with Zemlinsky, who studied with Brahms, who had an almost family connection to Schumann. So people knowing people and imparting some sort of ideals of musicianship and aesthetic, there is a lineage. Having said that, if there is any composer that I feel very, very close to in terms of aesthetic spirit and general project, it's Ives. I continue to be very moved by his music. It's anything but flawless. He was a composer who wrote often in haste, and who some people say was not the most professional of composers literally and figuratively. BD: You don't have any latent desires to sell insurance, do you? RC: Not at all... I don't want to make lots of money and have a heart attack. BD: And Ives wasn't really appreciated until after he was gone. Presumably you are appreciated to some extent now. RC: Yes, though in terms of appreciation, you have to have a very realistic vision of what it is. All non-commercial music in America and within the world is relatively marginal within our culture. Even if you win the Pulitzer Prize and the Grawemeyer and the MacArthur, still no one knows who you are. People on the street won't recognize you. If you advertise the awards, people will say it's impressive, but you still won't be a major cultural figure. BD: Then why do you do it? RC: Because I love it. I love the sound of it. Because there's nothing like hearing something that you've written that you're satisfied with and hearing it done well. Because, for some reason, I believe in the cause, in the necessity of it. One of my teachers, who was incredibly important for me was George Rochberg. He's extremely prone to Grand Announcements, which was one of the great pleasures of studying with him. It was a moral education in aesthetics that I received from him. He would say things like, "If we, composers and artists, stopped making art, the world would fall apart I promise you!" It's like Atlas holding up the world. BD: Is he right - would the world fall apart? RC: I think the world would have a harder time in the long run. BD: It would be much poorer. RC: It would be an increasingly uncivilized place. I do think that the time we're living in, when we're confronted by challenges to what we call civilization, people appreciate more things that are intangible after a period of enormous materialism and celebration of almost purely materialistic values. There's a certain re-appreciation of what is valuable in the intangible. In that sense, art is a consolation. It can have redemptive power and I think people recognize that. Without going into any concrete or specific religious content, art has a certain sacred function to it. BD: Is there a spirituality, then, to your music? RC: I would hope so, though I wouldn't want to pin it down. The spirituality does come from similar sources to Ives' because he was very drawn to and influenced by the American Transcendentalists. 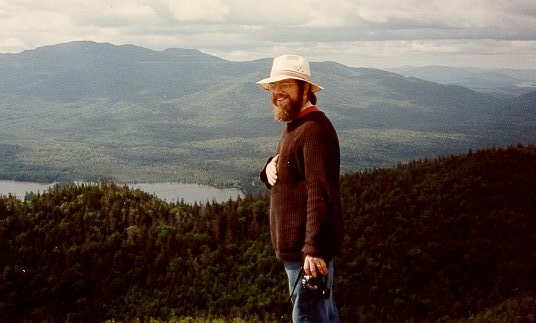 That type of individualistic, undogmatic sense of a spiritual reality, which is a kind of pragmatic spirituality, which is very American, I find appealing. I am drawn and have studied various aspects of Buddhist thought and practice, but I don't want to call myself a Buddhist because that's a commitment I've not made. But I'm drawn to it and it resonates in me. BD: I wonder if you, along with many or most other composers of Art Music explore the sounds and explore the musics and then explore the various kinds of things that are in the ether in terms of spirituality. RC: I think many do. Certainly the music which has come from Eastern Europe since the fall of the Soviet Empire has dealt with this very very intensely and explicitly. Think of the music of Arvo Pärt, which is highly mystical and liturgical in nature, to Sofia Gubaidulina which is much more dark and humanistic, and Giya Kancheli which is unbelievably sad and sort of depressive, but feeling the vastness of sadness. But you also have other composers who have cultivated a bright, pop-ish quality which is an aspect of post-modernism which may have run its course. There's a sense of wanting to have surface, and the tone is ironic and reveling in getting away from too much depth which can feel lugubrious. The line if very thin. By trying to be "deep" you can become self-aggrandizing. BD: Is it good that we have these divergent lines in music these days? RC: Absolutely. I think it's great to have this sort of diversity. One of my other lives is that I am a critic. I write for Fanfare, which is one of the few surviving Classical CD magazines left in the U.S. I review a lot of contemporary music on recordings and no matter what my personal taste is as composer, I love the challenge of bumping up against things that are very different. They open my horizons. I feel I can appreciate quality in them in terms of concept and realization when they are present, even if it's not in my aesthetic as a creative artist. BD: I was going to ask if you were able to separate yourself. RC: It's like concentric circles. There's a certain core which is the creativity, but I can go further out among the circles where I don't feel threatened by encountering things which are outside of my core. BD: Without mentioning specifics, are there times when you're really happy you write as you do rather than as this guy you're listening to? RC: Oh yeah. Absolutely. I tend to really like new music, so I can be a constructive critic, but every now and then I run into something that I don't like at all. If I think there is enormous technique being squandered on a shallow vision, that will raise my hackles. BD: So you're disappointed in it? RC: Exactly, because the composer is so musical and so talented. If I have any historical role, I do NOT want to end up in the next edition of the Lexicon of Musical Invective [by Nicolas Slonimsky]. I don't want to be known to have made a stupid judgment on contemporary music. BD: Does it behoove you, then, to write a favorable review of the piece and later write a letter to the composer telling him to get his act together? RC: No, no. If I'm going to say something, it should be in print, but it should balanced. The major thing for reviewing contemporary music is just to describe it and to give it context. If you have an opinion, great, but it must be labeled as such. BD: Is there anyone who is writing who knows that you will review the piece, so they purposely do it as they think you would approve? RC: No, I don't think so. People send me records to review, but I can't imagine anyone wasting their time like that. As a composer, I might send one of my pieces to an elder statesman whose music has been dealing with some of the same things, and ask him to take a listen. Now and then, that kind of thing gets a response, but often it doesn't. If you have a piece like that, great, but to sit down and write something to fit would be a betrayal of self. BD: When you review discs, are they generally composers who are trying to get established, or do you ever have to review Carter or Boulez? RC: Both. My end-of-the-year ‘want list' has items from all over the map. BD: Should your list, or perhaps someone else's list, have music of Robert Carl? RC: I refuse to answer that one. I'd love it, but whether it ‘should' or not is like your career - you have to work at it, but you cannot control it. You have to do everything you can, but you cannot have expectations. You do your best and then it's going to happen or it isn't. You shouldn't be a shrinking violet when trying to get your music out into the world, but art is like the nature film with the bunny being chased by the lion. As a musician, you are the bunny. What I mean is that aesthetic history is quite ruthless. It doesn't take pity on artists. Whatever serves the needs of the culture and the time. The good and bad news is that the needs of a particular time may be a time 500 years from now. Who'd have thought that one of the most important composers at the turn of this millennium would be someone from about 900 years ago, and a woman! Hildegard von Bingen, is possibly the first major composer, predating Leonin and Perotin! Her chant has a certain kind of wild melismatic quality that is distinctive. BD: I wonder if it speaks to us because it is so different from anything else. RC: Perhaps, and it also hooks into the new-age mysticism. Hildegard didn't think to herself, "Hmmm, 900 years from now, my music will be appreciated!" Whether you are or are not appreciated in your time, you never know, so that's why you have to do it as an act of faith. BD: Are we throwing in a joker - the legacy of round, flat plastic performances that you have made or approved, whereas Hildegard could only leave the notes that we must guess as to how she wanted them to sound? RC: Certainly, in one sense, we as contemporary composers have more things going for us. We can leave more concrete artifacts of the work. We have scores, CDs, videos, reviews, etc. If we're lucky, we have someone such as yourself interviewing us to get some sense of who we were at a particular time. BD: But the disc is the actual stuff. Not talk or musing, but the sounds themselves. RC: The disc is a reference point. I have a firm belief that every performance has its own dynamic. It takes on its own life because of the people who are involved in it. BD: This is, of course, the other side of the question - is the CD going to limit future performers in their quest for their own interpretation? RC: It depends on their attitude toward the artifact. My feeling is that performers get better and better all the time. I've had fantastic performances, but twenty years from now, it will be played so much better. We have examples of things written and recorded years ago which are played and recorded so much better today. The composer's own group did fine, but now the student groups can play the hell out of it with identification and conviction. BD: So aside from the technical achievement, this new stuff is getting into our collective blood? RC: Yes, and that happens over time. Players years from now will listen to our recordings and see all the mistakes we made. They'll also look at the score, which no matter how precise you notate, is still a map or a guide for interpretation. You can't fix everything. Brian Ferneyhough tries, and his scores are just black with notes and instructions trying to regulate every parameter of the act of performance. But that degree of over-notation and information overload forces the performer into a transcendent state which moves beyond it. BD: Have you been basically pleased with the performances you've heard of your music over the years? RC: Yes, I have. Every composer gets performances of varying levels, but I have had remarkably few clunkers. I'm enormously grateful to performers because, though I perform periodically, I'm not a performer. The reason that I perform is to get inside the mindset so I know it. It's a bit of an act of solidarity. I know what it's like for them. I've known the terror. But in the end, they do it. They are the athletes, and I'm not. I'm the coach. BD: Are there times that they discover something and you are surprised you wrote it that way? RC: Yeah. In one sense, it's a complete mystery to me where it comes from. In terms of my music, I'm really quite flexible about a lot of the details because I do believe that interpretations will vary from performance to performance, and if you believe you're going to get more than one performance, you have to be willing to adapt to the fact that a performance is a social and political setting. You're dealing with a group of people getting together with a common goal, but there has to be some aspect of negotiation and respect that is mutual. BD: Is it a common goal, or just a common general aim? RC: That's a good question and I'm not sure whether I could really pin down how different it is. The common goal is a good performance of the piece at hand. That's more general, not a goal of exactly-this-result. The result is something that is musical, communicative, and ideally has the notes and rhythms that are on the page. Now and then, if something goes a little kaflooie and it's still communicative, I'm not going to freak out. I will say something about those little flat plastic things, though. If I get a good performance, I always try to get the performers into the studio to make a good studio recording of it so we have as close a reference at that point to what is a highly satisfying, if not an ideal or definitive performance. BD: Well, when they traipse into the studio the next day, are they able to re-capture that quality you heard in the performance? RC: Yes and no. You break it up into multiple takes and you create the illusion of it. The technology is so sophisticated now that post-production is just extraordinary. We can take out a tiny blip on an attack or take a passage that was just a bit under tempo and speed it up a little. You can do these things. I've made splices from different performances in different halls and we re-manipulated the reverb levels so it sounds like it's all from the same place. BD: At what point does that become a fraud? RC: That's a wonderful question. It depends on how you present it. No concert performance is ever perfect and we live in an era of studio standards for what we listen to. What you're trying to do in a studio recording is get as close as possible to an accurate rendition of the piece, but at the same time project real musical spirit. I try, as much as possible, to get as long a take of any portion of the piece as I can. I would prefer something that is even a little imperfect if the broader impact of the line comes through. BD: Let me think forward a bit. You say performers are getting better and better. Might you ever have an idea that current performers can't do, but eventually you hope they could accomplish, so you electronically manipulate the sound to give those future players an example of it the way you'd like to hear it eventually? RC: That's a fascinating idea. I don't know if my imagination is that great to think of unplayable things. As a pianist, there are a couple of things I can do that ‘real pianists' have difficulty doing. I can trill really easily and infinitely. I don't know what it is, but I can do it, and I've found myself doing a trill with two fingers and using the remaining fingers to pick out some sort of melodic gesture while the trill is going on. BD: Like the "Devil's Trill" on the violin with its left-hand pizzicato! RC: Exactly. Now that's something which is pushing at the limits of technique for a lot of really fine pianists, and is almost unnecessarily awkward. My feeling is that in the long run, it will be no issue at all. (Remember how many rehearsals were needed for the first performance of Ionization and now kids can sight-read it without too much trouble.) Whether it's in my music or not, that sort of technique will be child's-play, so, I don't mind writing it. I might use an extra line above as an ossia, or it could be handled by a second player - such as the page turner. But the music would not be unduly compromised if it was not played, and if I insist it be played, it would gum up the works and make a far less satisfying performance. Having just heard it that way in a performance a few days ago, I can attest to this feeling. RC: Yes, I am. Despite the terrible state of ‘Classical Music' in the US and the world, the marginalization of it, and the juggernaut of highly commercial musical values (which rolls over things like a steamroller), I still can't help but be optimistic because there are millions of people who just want something more. I see it in students who come in with no experience of any real art-music. They just played in a band and knew there must be something more. There's always a yearning for something more substantial by people who are more mature. BD: Does this same optimism hold for musical composition? RC: I think so. There are audiences who ultimately want more in the long run. There are performers who want challenges. Schoenberg's music would not have survived to this point if it were not for performers. Performers have kept it alive because it's a challenge - not because they think it's the greatest music in the world. There's a satisfaction you can't get in other repertoire. And the students of composition give me faith because they love writing music which is often abstract and is done for its own sake. They're not afraid of dealing with various classical traditions - not just the Western styles, but also jazz and world music. Things that have deep roots and expansive aesthetics. I have no illusions. We may be in a dark age right now, but we'll come out of it. Music will survive in the long run. It's honestly something that I have absolute faith in. If mankind survives, the impulse to make music of a certain degree of depth and seriousness cannot vanish because it's too much in our genes. BD: Are you at the point in your career you want to be at your age right now? RC: Excellent question. The answer is yes, but qualified by the fact that I've never met a composer, no matter where they were and how many prizes they had, who didn't gripe about lack of recognition. Even the most successful ones in the world do this, so I take that with a grain of salt. I think in terms of what I want to do with my music and how it is being realized and disseminated, and I have very little to complain about. I hope that I can just keep continuing in this line of development. I started relatively late. I wasn't a music major in college. I was an American History major. I got interested in classical music at the end of high school and when I got to college. I went to Yale and was there at the time of the Ives centennial. I heard just about all of his works performed live and it was a life-changing thing for me. I got up enough courage to make the plunge to go into music after graduation, but I did graduate work as a sort of catch-up on all the things I didn't know. BD: So your maturity might offset the delay in getting started? RC: I have no regrets of studying history as long and intensely as I did. It gave me a broader sense of cultural issues than I would have had otherwise. BD: Does it give you a better sense of where music fits in to the historical whole? RC: It makes me more aware of the fabric of music history and how things connect over time. RC: Thank you for being interested in listening to composers talk. Visit Robert Carl's Website [ http://uhaweb.hartford.edu/CARL/ ] . Visit Bruce Duffie's Website [ http://www.bruceduffie.com ] , and send him e-mail [ duffie@voyager.net ] . Bruce Duffie is a regular contributor of interviews to New Music Connoisseur. Next time, a special conversation from the archives with Virgil Thomson. Later, a chat with composer Elizabeth Austin, and after that, pianist David Holzman. You are invited to visit his website for more information about his work, including selected transcripts of other interviews, plus a full list of his guests. He would also like to call your attention to the photos and information about his grandfather, who was a pioneer in the automotive field more than a century ago. Linked from New Music Connoisseur Magazine in March, 2002.